I met Kristin in 1985 when we were working on a documentary film about Nicaraguan poetry (Azul) directed by another friend and neighborhood resident Roland Legiardi-Laura. 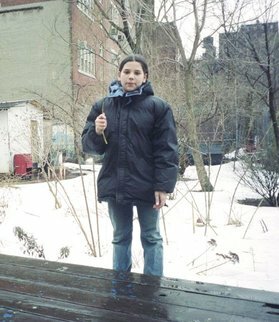 Shortly thereafter I began to see Kristin in the neighborhood splattered with paint, hanging out on scaffolding with her murals blooming in the devasted landscape that was Loisaida at the time. 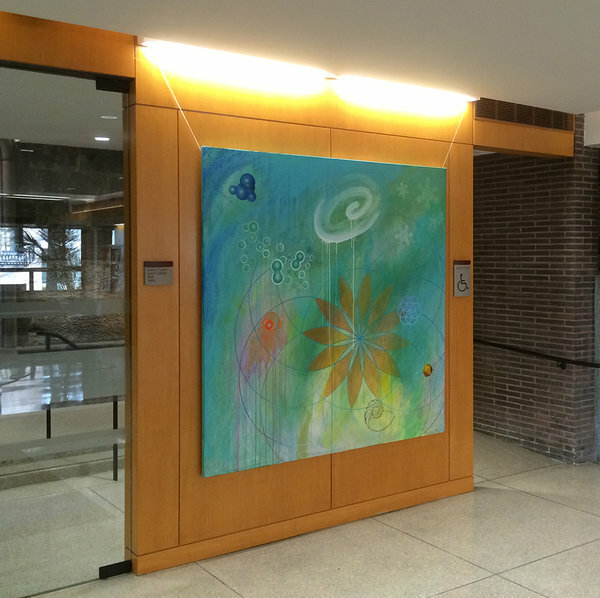 What inspired you to create large-scale paintings on walls? I graduated from Pratt Institute in Brooklyn with an MFA in painting and had a studio in my loft. 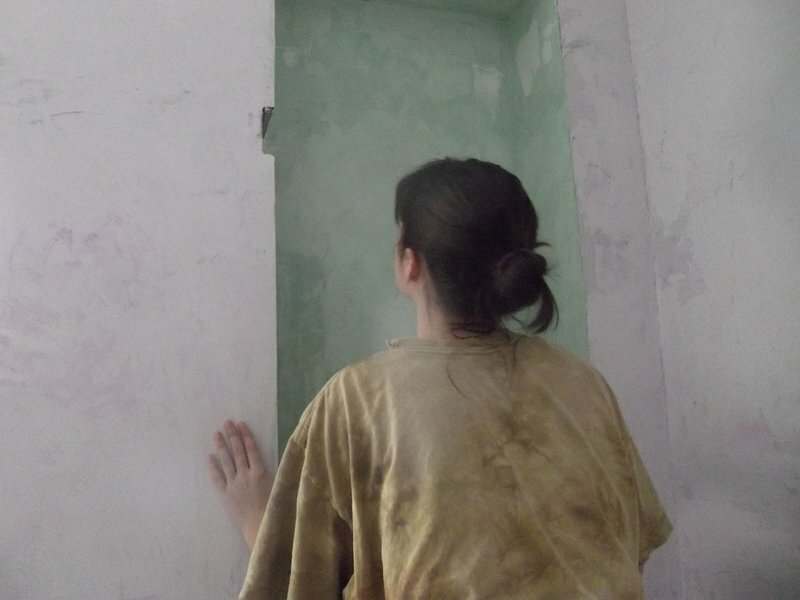 Although I was involved in several artist activist groups, I started feeling isolated. I had a friend from Paraguay who was very politically active with Latin American causes and our anti-intervention politics of the US in Central America coincided. One day I was griping to him about the lonely existence of the artist when he pointed out to me that only Americans and Europeans viewed the life of the artist this way. He opened me up to making art for and with the community in Latin America. So I started looking around for arts groups in NYC who were doing community work. I was reading a copy of a Spanish community magazine called “Ajá” and saw an open call for muralists. 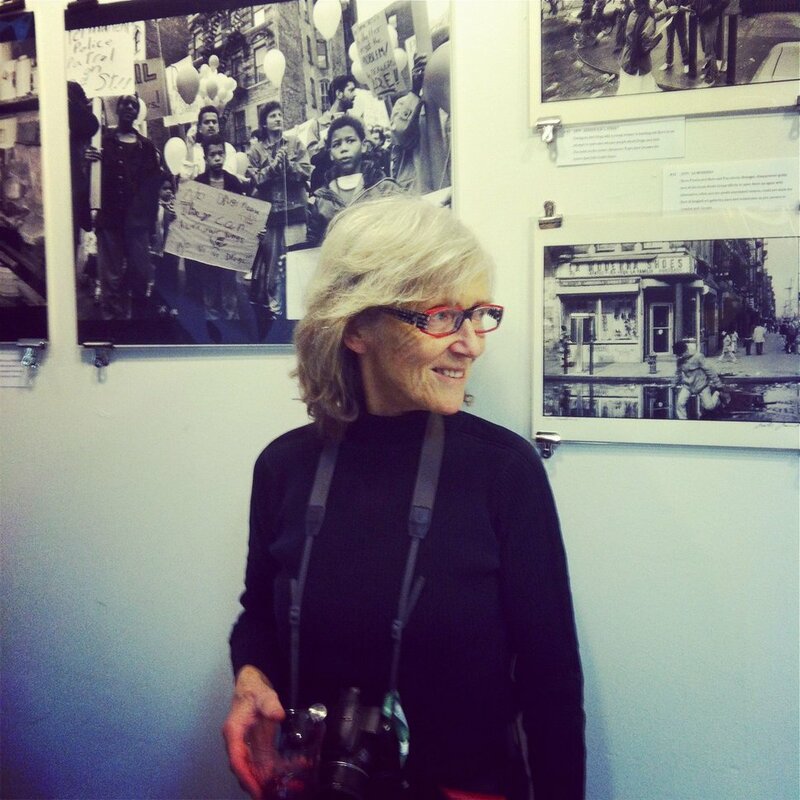 My friend, Robin Michals and I decided to contact the group “Artmakers” who was organizing the project and write up a proposal for “La Lucha Continua in Latin America, South Africa and The Lower East Side”. 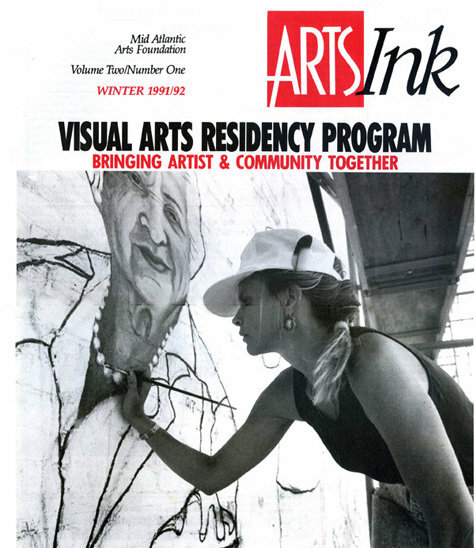 Artmakers is an artist-run, politically oriented community mural organization established in 1983. 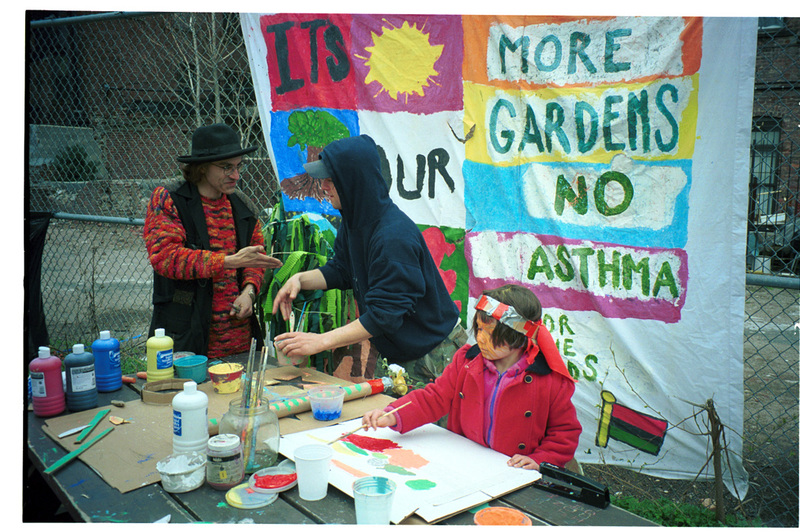 What inspired you to make community art and what drew you to Loisaida? 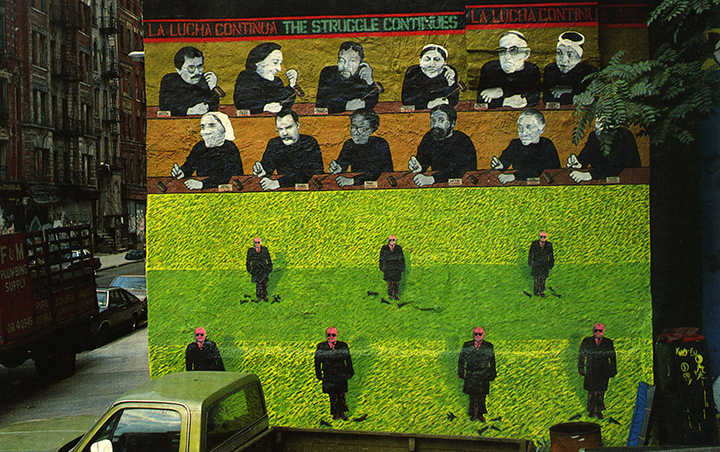 The “La Lucha” project was to put multiple individual murals on this theme and one large group-produced mural in a large area where buildings had tumbled or been demolished between East 8th and East 9th Streets and between Avenue B and Avenue C. A park had been constructed by community residents there but it was a mess—full of weeds, used hypodermic needles and garbage. It was hard to keep the junkies out. Artmakers accepted our proposal and we collaborated with the group of involved artists to clean out the garbage and weeds, prime the walls of the canyon of surrounding buildings and get to work creating a riot of color on the walls. The bleak lot was transformed into a playground, outdoor performance space and a clean, safe place for the community to hang. 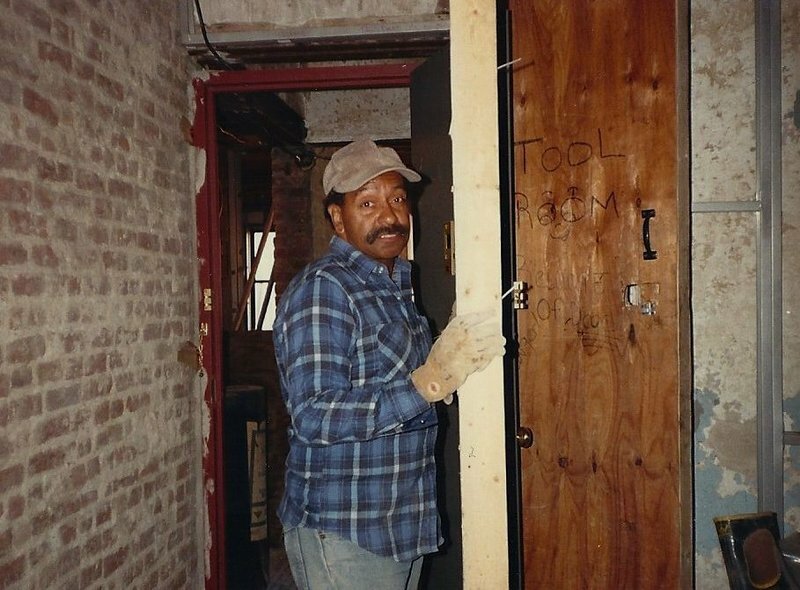 I spent the summer of 1985 making a public work which involved community members and was very popular in the neighborhood. Our wall was called “The Last Judgement” and depicted a jury of twelve overlooking a scene of grizzly looking white businessmen with missile toys at their feet in an abstract color field. For the jury we selected six leaders from Central America and South Africa: Daniel Ortega, Ruth First, Nelson Mandela, Rigoberta Menchú, Archbishop Oscar Romero and Winnie Mandela. And six community members who were recommended by the people who lived in the area. They ranged from the street mechanic who worked right next to the wall, a homeless man who inhabited the block, an elderly woman who had single-handedly started a thriving community garden around the corner and three other colorful and well-liked neighborhood people. 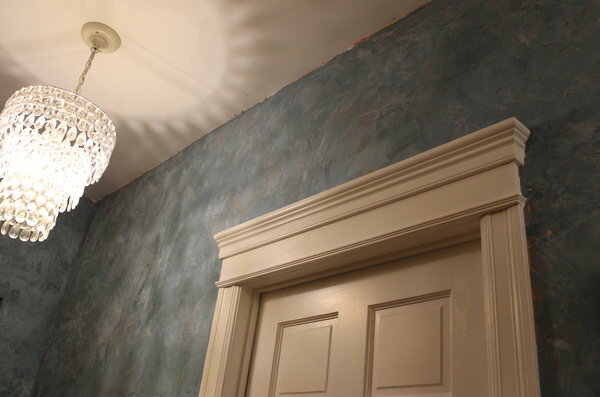 Our mural generated much publicity and interest. Our piece was written about in “In These Times” by art critic Lucy Lippard and I was interviewed by Jimmy Breslin for the New York Post. The highlight was when Rigoberta Menchú from Guatemala came to New York to give a speech at the United Nations. One day there she was smiling in front of our mural. Word had gotten to her somehow and she came down to see it and meet us in full Quiché dress. 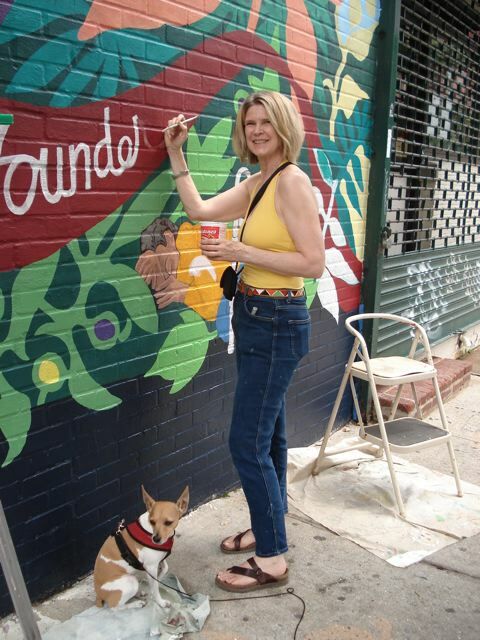 The following summer Robin and I raised the funds for another much larger mural on East 4th Street and Avenue D. We used the same concept to get the community involved and chose a site where a lot between two buildings had been made into a park by the priest from the church next door. He created a brightly colored gazebo, brick pathways, put in a swing set and planted a garden for children from the community to play in. Unfortunately the drug trade had reclaimed the lot and not many children played there. We invited people to recommend neighborhood children to portray and then selected eleven kids. 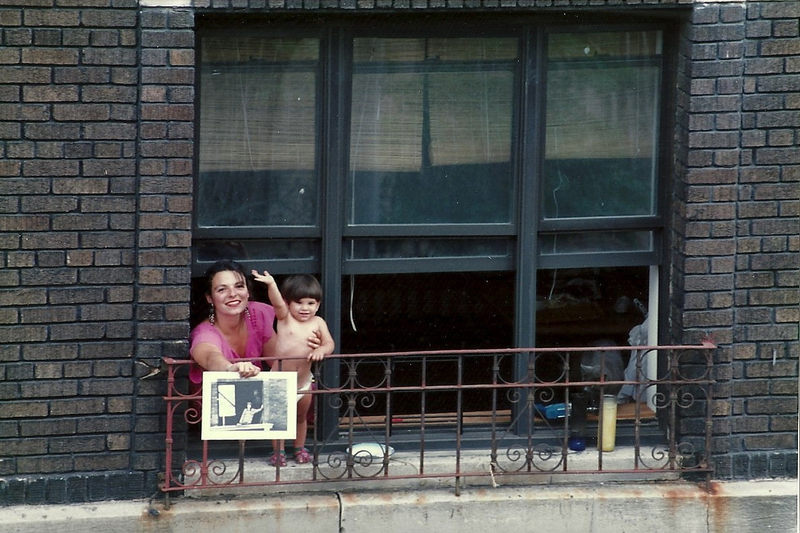 We spent the summer of 1986 practically living on a scaffold on East 4th Street. At first there was suspicion that two white girls were cleaning up the neighborhood to make it nice for a gentrification that would push them out. But our friends and allies from 8th Street let everyone know that we were cool. The drug dealers caused a dilemma when one of them insisted that his son and his toy gun be painted on the wall. After meeting with community members we decided to comply in order to keep us and others safe during the project. 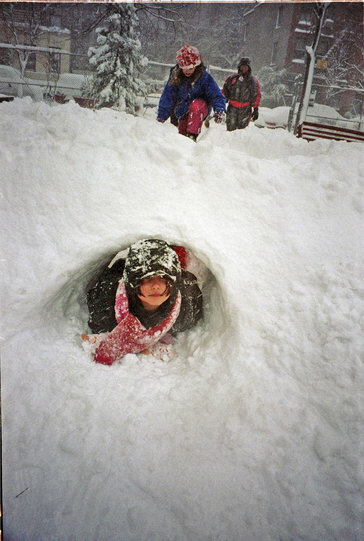 Then one day our friends told us not to come around for a few days. The word was that several busts had occurred in the yard and the “big” off-site drug guy was sure we were narcs planted there and that there would be a reprisal. So we laid low until we got the word to come back. There had been a negotiation on our behalf by community members to clear the way. Another day when we rode our bikes to the site and locked them on a parking sign, turning our backs on them as we frequently did while working—they disappeared. But the word went out among our friends and the bikes mysteriously returned the next day. We had the feeling that a force field of community support surrounded us. After the mural had been completed for a few months we received a call that someone had tagged the mural with spray paint. 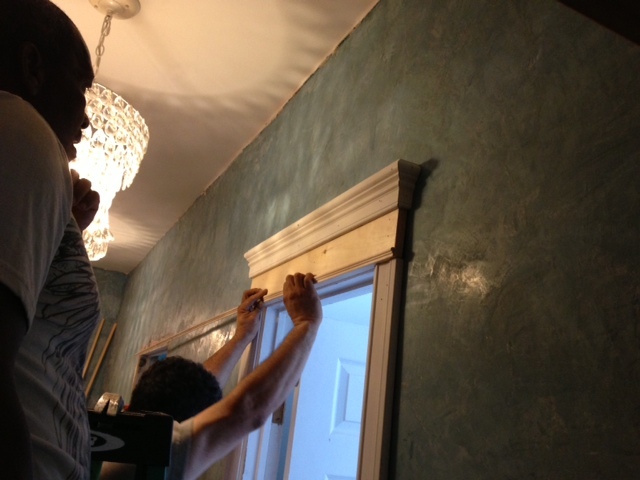 We spent a day researching how to remove Krylon from oil paint and hurried down to remedy the situation. A tag can be the kiss of death. It’s an invitation for others to do the same—one tag being the catalyst for a free-for-all. But when we arrived ready to remove it—it was gone. Someone from the neighborhood was faster then we were. 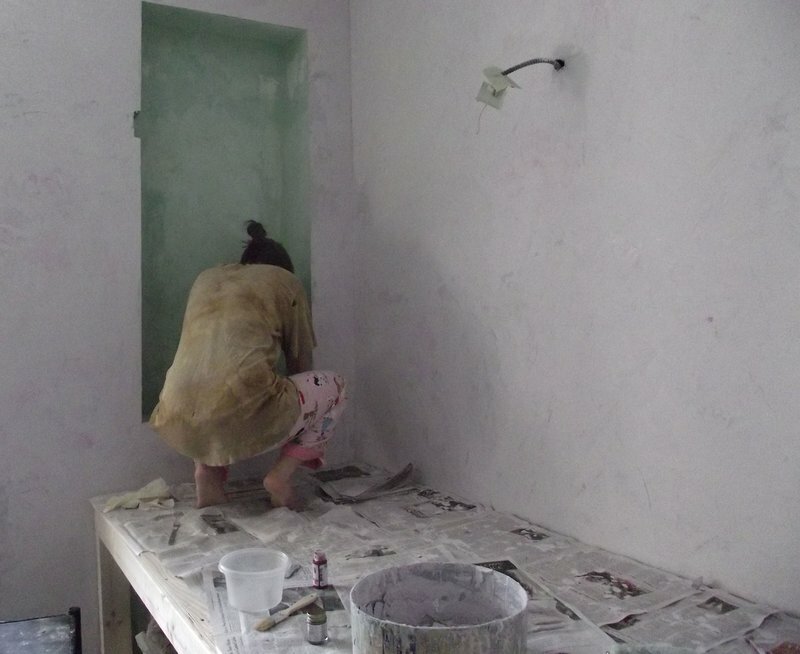 By doing this kind of work, I made many friends in the community and with other artists that I cherish to this day. 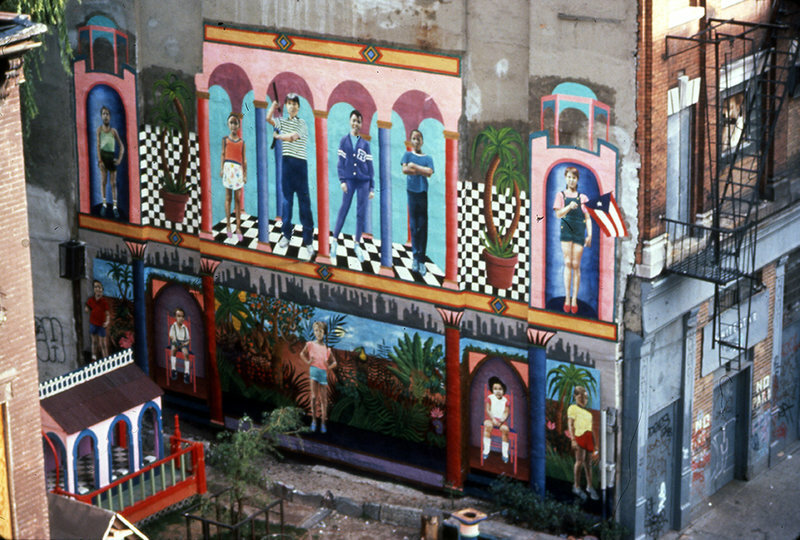 When I arrived at the site for Artmakers La Lucha project it was the summer of 1985 and it was a blighted no-man’s-land. There were many abandoned buildings, empty lots where buildings had tumbled down. Drug selling frenzies were commonplace. Someone would walk out on the street with aluminum packages in his hands and the addicts would swarm with money held high in their fists. Cops just didn’t seem to care. There were blocks where the landscape was fallen brick, debris, graffiti and boarded-up buildings. But it was an exciting time and many interesting community gardens and casitas were created. It was an invigorating nexus of politics, art and music. 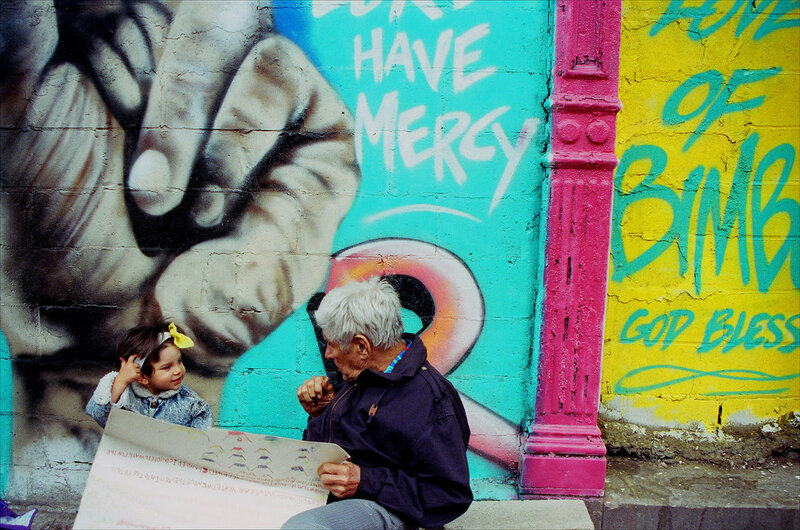 What do murals do for a community? The creation of a public work of art generates pride. Most people want to live in a nice place but can be overwhelmed by the degradation of things falling apart. When someone starts the ball rolling it is contagious. Colorful paintings that are relevant to the people who live there give a sense of hope and pride. But to make the magic happen it helps to involve the community, be open to their input and ask for and accept their help in the way they want to give it. What inspired you to became an artist? My father was an artist, as was his mother and he had me painting by the time I was four. 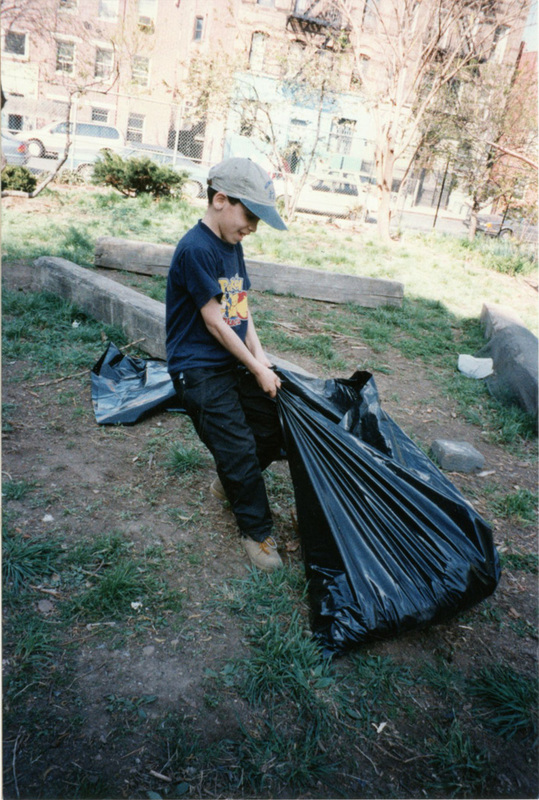 At age six he enrolled me in art classes at the Museum of Modern Art. I thought I would be taught how to draw and paint the world around me. But it was the late 50s and Abstract Expressionism was in its heyday. The teacher had us make mini Jackson Pollacks by squirting paint from plastic ketchup bottles. I was thouroughly disappointed. In 2005 I became certified as a Reiki Master/Teacher and began doing energy healing work (www.HealingReikiBrooklyn.com). After this, my work changed drastically and I began making abstract work with geometric shapes and lines. I have a studio at the Brooklyn Army Terminal in Sunset Park Brooklyn through chashama.org and am currently showing twelve new paintings in “The Gallery At First” which is in the First Presbyterian Church on Fifth Avenue and 12th Street in the Village. The work will be there until the end of June and can be seen during the week and on Sundays at 12 West 12th Street. I continue to work on projects with Artmakers. 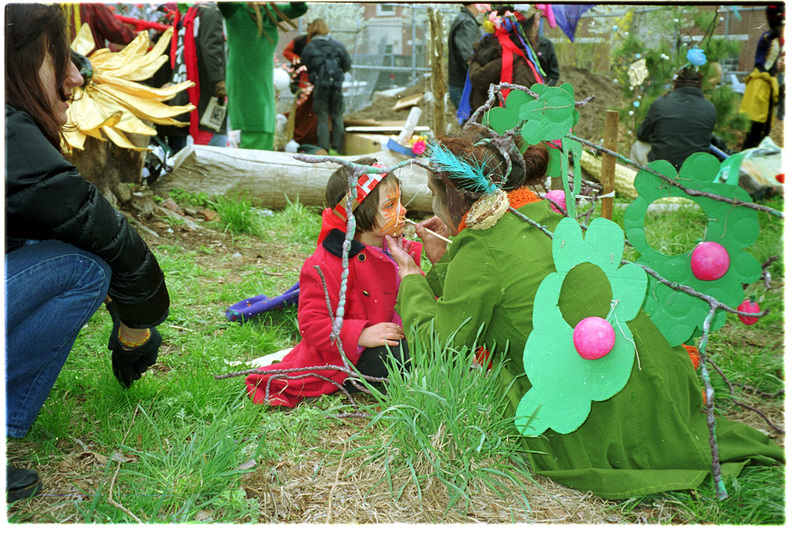 In 2005 I worked on “When Women Pursue Justice” with Artmakers in Bedstuy, Brooklyn. It’s a 3,300 sq. 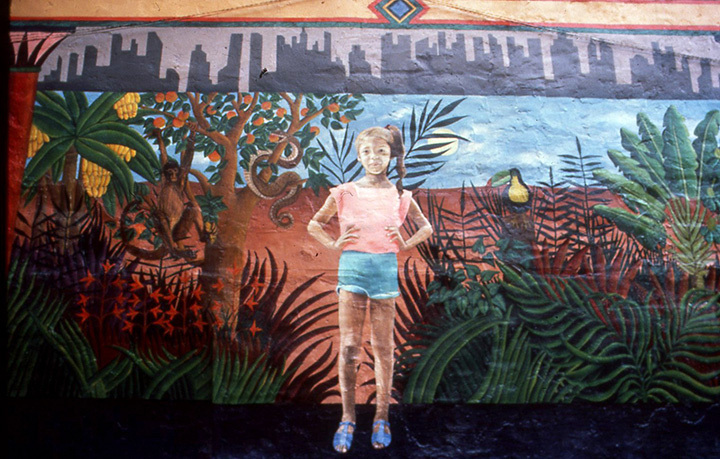 ft. mural that can be seen at 498 Greene Ave. at the corner of Nostrand directed by Janet Braun-Reinitz and Jane Weisman. It depicts 90 women activists, both historical and contemporary. My contribution was a 6-ft. portrait of Fanny Lou Hamer. 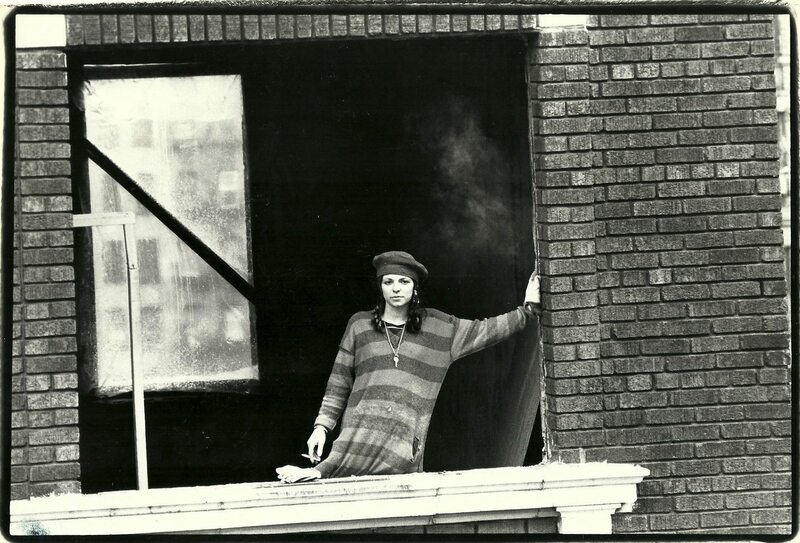 In 2008 I ran into you on East 3rd Street while helping to restore an R.I.P. 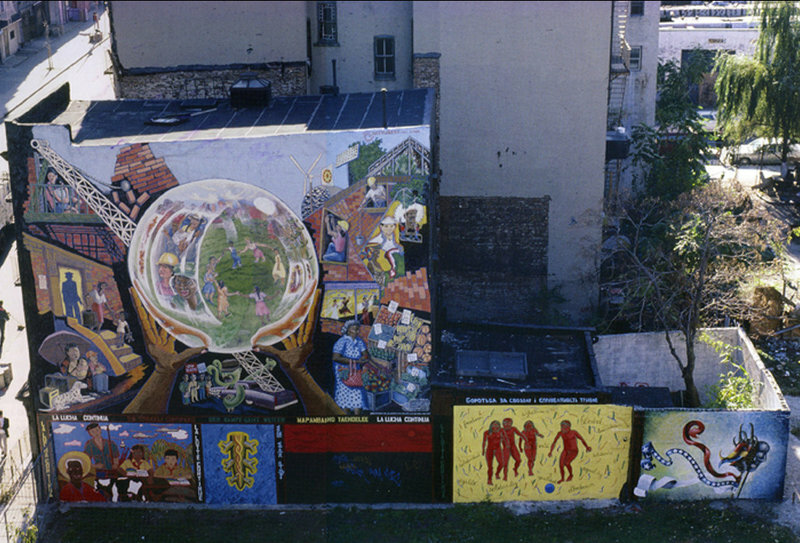 mural created in 2002 for Eva Cockcroft, founder of Artmakers. 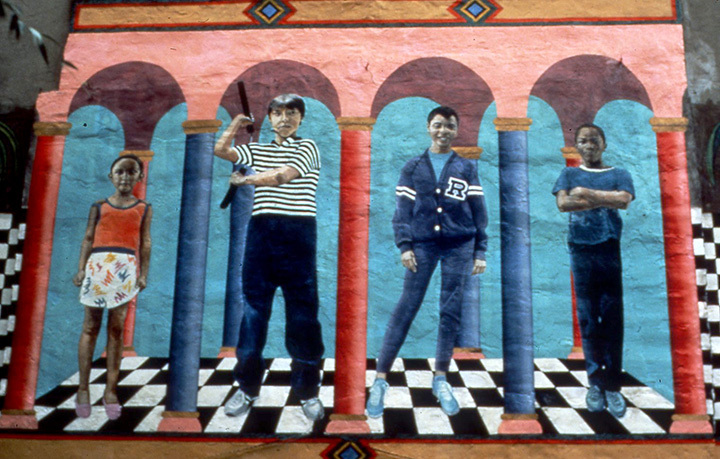 You and I had met originally while I was working on the Enchanted Garden mural on your block in 1986. 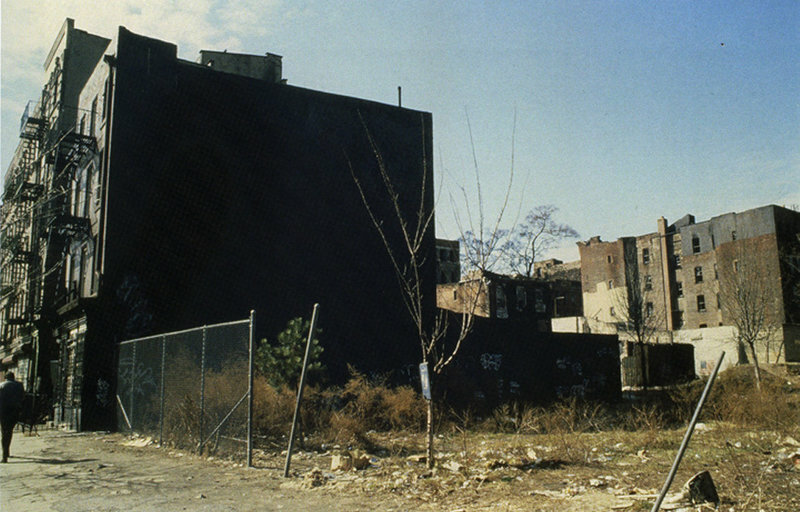 In June I expect to be working on a mural with Artmakers led by Camille Perrotet at PS 94 in Sunset Park Brooklyn. I have known Marlis since I started working on the homestead. Her building which is across the street from ours, was the first homestead building to be completed and occupied on our block. They were all moved in when we were just getting started pulling out the burnt beams. Their building was the proof that it could be done and it shone like a beacon for us. They gave us electricity and smiles of encouragement. I watched Marlis’s son grow up and she saw my daughters born and raised. It is unusual in New York to be so rooted to a place, to a particular block and also to be surrounded by people who are just as rooted. Long-time neighbors. Most New Yorkers move around. It is as though we are living the small village life even though we are in the middle of a giant metropolis – the so-called concrete jungle. Marlis was born in the bombed out city of Berlin WWII so when she came to Loisaida in the 1970’s this was a familiar landscape. 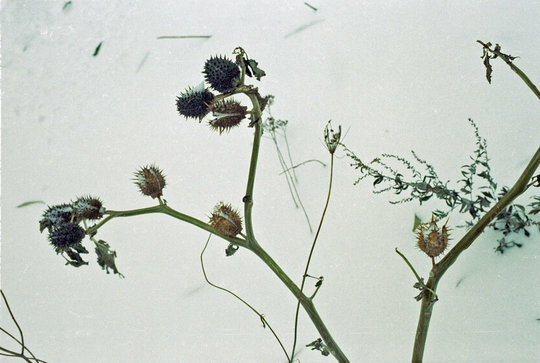 Marlis Momber’s photographs are full of soul. Yes, they have good composition and are well-crafted and her prints are exquisite. But aside from being an artful photograph, they reek of the soul. 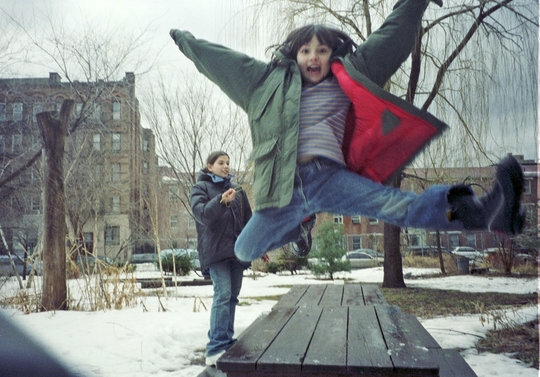 She is not a mere documentarian or onlooker – Marlis captures her subjects down to the essence. We are hers and Marlis is ours. Below is a 10 minute clip of her 1978 film Viva Loisaida. To purchase the full DVD or prints contact her via her photography website, to see more photos go to www.vivaloisaida.org. 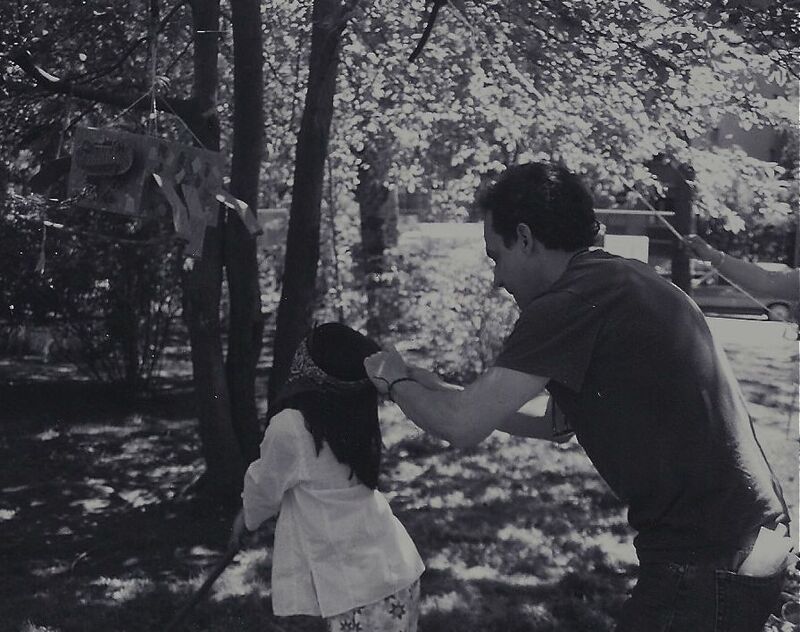 I have been very lucky that Marlis has photographed my family for many years. Here is my portrait of the artist taken this past spring at one of her exhibitions. In the middle of New York City, I can hear bullfrogs and see fireflies at night in the summer from the community garden next to our building. Until the kabosh came down, for many years we woke to the sound of roosters crowing. The garden had been a rubble-strewn lot that was reclaimed by the community and became a park (click here for early history and photos). As soon as the green took hold, children flocked to the garden. It was a good place for playing tag and red rover and climbing trees. The mulberry tree feeds neighborhood kids every June with organic berries. They perch on the branches like birds focused on berry picking with their mouths and fingers stained purple. Oona – Rites of Spring celebration. 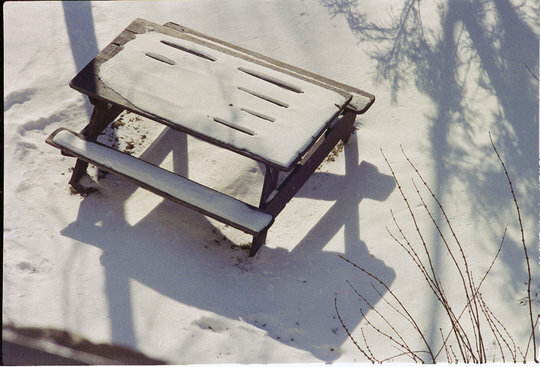 Photo: David Schmidlapp. 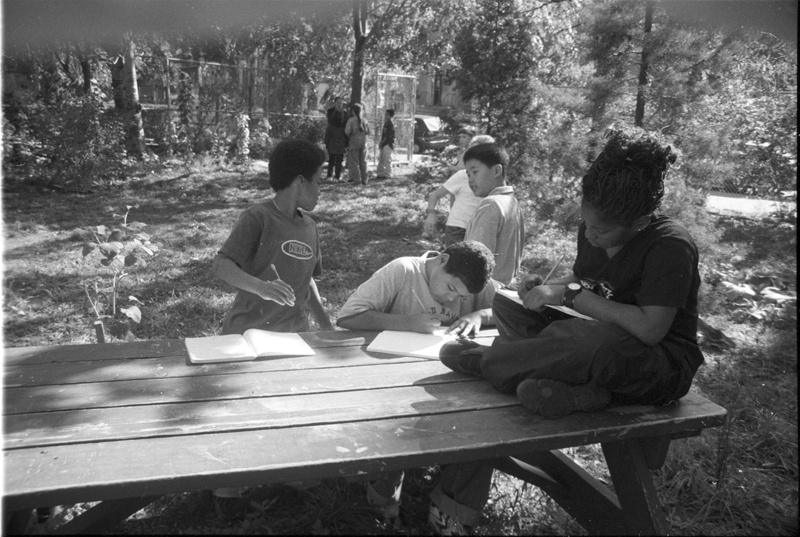 The elementary school on the block holds classes in the garden. One year the students constructed a weather station that I thought was brilliant and I would watch from the window as they measured the wind and humidity and jotted down data in their notebooks. 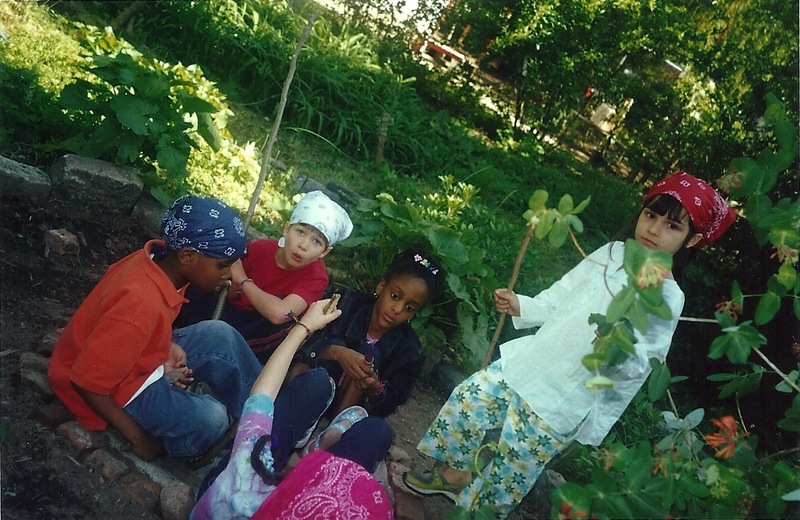 The children identify plants and test soil and study in the sun. 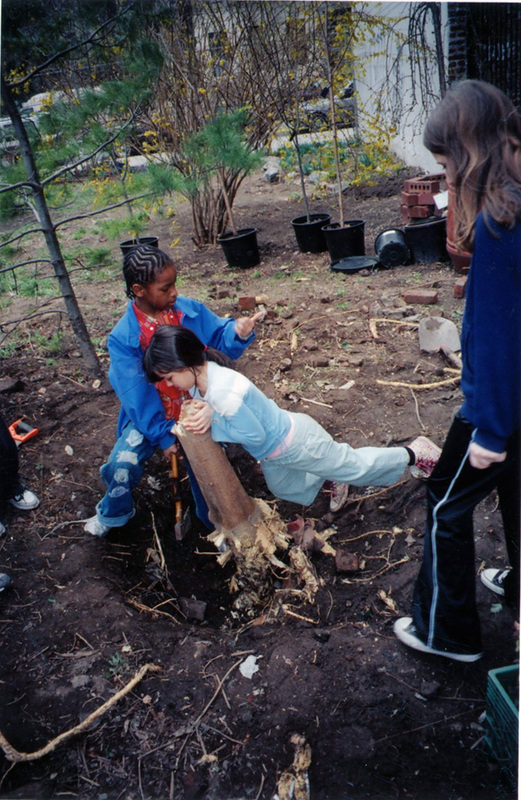 Children have always helped with the work in the garden, because they like the dirt and moving rocks around. By the year 2000, the garden had turned the corner. It became lush and wild. The dirt was soil and not brick dust. Things grew by themselves. Wild birds and firefiles came. You can smell the dirt and the green as soon as you approach El Jardin. You can hear crickets in the middle of Manhattan. Pirates in the wilderness at a birthday party.